Does your dog like carrots? Then he'll love these carrot cake dog cupcakes for your next dog celebration. What could make this free dog cake recipe even better? How about cream cheese and applesauce dog treat icing! Decorate the top of the muffin with extra shredded carrots for a fun twist. 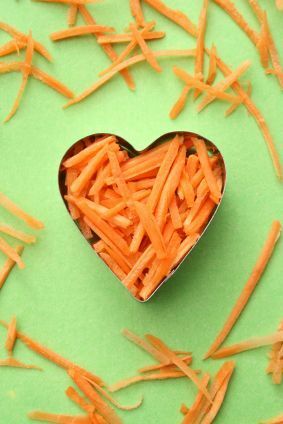 So you probably know that carrots are high in vitamin A, but did you also know they are rich in dietary fiber, antioxidants and minerals? To add to the fun of these dog cupcakes, why not try another color of carrots. Yep, carrots not only come in orange, they also come in yellow, red, white and purple! Substitute or add any of these other colors of carrots for variety. Lightly spray cups of muffin tin. In a large bowl stir together the carrots, eggs and applesauce. Set aside. In another medium bowl whisk together the cinnamon, oats and flour. Slowly mix in the dry ingredients. Stir until well blended. Spoon mixture into muffin tin. The dough will be thick, so you may wet your fingers to press the dough into place. The dog cupcake will not rise very much, so do not worry about over filling the muffin tin. Cool completely on a wire rack before frosting or serving. Blend both ingredients with a hand mixer until well blended. Spoon into a pastry bag for easy decorating. Storing: These dog cupcakes will keep fresh in your refrigerator for 2 weeks. You can freeze them for up to 2 months. If you are going to freeze them, do not decorate with the frosting until they have thawed. For more information on how to store homemade dog treats please review our tips. You can choose to make a cake or muffins with this dog treat recipe. Our instructions are for muffins, but to make it a cake, simply pour the batter into a lightly greased cake pan or loaf pan. Start with the suggested baking time, then check every few minutes to see if it's done. Don't have a pastry bag? No need to worry, just use a plastic resealable bag. Once the frosting is spooned inside, cut a small tip off the corner. Then pipe the dog treat icing on as usual. Or use a spatula to spread the frosting. Want to try another icing? Check out our other dog treat icing recipes for more ideas. Do you have left over frosting? Don't throw it out! Spread a little on two dog cookies, then press together to make a sandwich cookie. If the muffin mixture gets too dry, you may need to add 1 tablespoon of water to get it blended properly. If you have a small dog, use a mini muffin tin instead. A dog cupcakes recipe with carrots or any other recipe doesn't need to be reserved just for dog parties. Show your little one you care by baking a fresh muffin full of vitamins any day of the week. Just remember, dog cakes, and especially ones with dog treat icing, are treats so be sure to limit the amount your dog can eat at one time. Can I Substitute a Grain Free Flour and Would the Amount be the Same? what can i feed my four year old moody female terrier ?